let’s come together for the Love & Unity Concert Tour 2012! It begins with the Love & Unity New Year Concert in Mirapuri and goes on throughout the year, bringing to you New-Topical-Songs, Cyber-Dance-Drive and Electronica Symphonies that will do you good in shockwave times and will strengthen your soul. Join our living celebration of humanity. It is Love & Unity that will count! 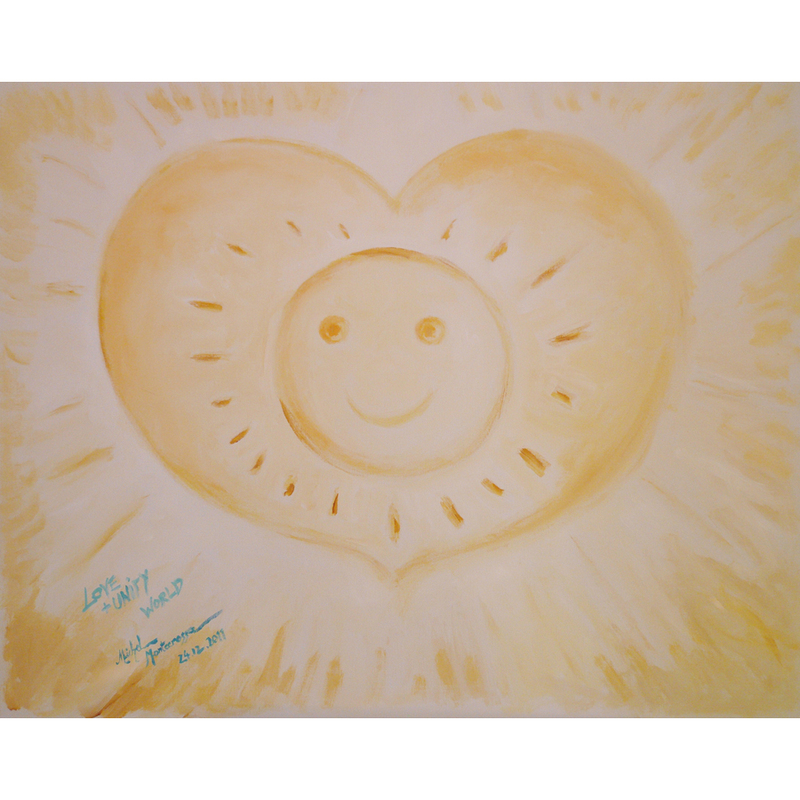 Here’s further information about Michel Montecrossa’s ‘Love & Unity New Year Concert’ (31.12.2011) as well as the presentation of Michel Montecrossa’s ‘New Year Symphony 2012’ during the meditation on 1.01.2012 at the Miravinci. On Saturday, 31st December the ‘Love & Unity’ New Year concert will lead you into 2012 with happy and inspiring dance and love songs. Before the concert excellent New Year menus (vegetarian and non-vegetarian) will be served, reservation for the menus is required. On Sunday, 1st January, 12 o’clock noon, you can join a meditation at the Miravinci – the meditation centre of Mirapuri, with the distribution of the Mirapuri calendar for the year 2012 and the premiere of the recording of Michel Montecrossa’s Love & Unity New Year Symphony including uplifting messages by Mira Alfassa – The Mother and recitations by her from Sri Aurobindo’s spiritual poem Savitri. In your song “Talkin’ World Awaking” you were refered among others to Greece. You also said that “The power is there of the people uniting». By your opinion, what is the element that can keep the Greeks and Europeans in general united, against the the economic meltdown and the corrupted politicians? Germany as much as Greece is in the hand of global banka criminality. There is no special position except that we all need a fundamental change of the world’s financial system, including full debt relieve for all EU countries, controlled change from speculator banking to real values banking, a stabilizing Euro reform that makes the Euro the currency of the United States of Europe – and all that followed by a fresh, unburdened start of the working hand free for future building. On December 31, 2011 Michel Montecrossa and his band The Chosen Few will play the ‘Love & Unity New Year Concert’ at the Omnidiet Resort and Business Hotel in Mirapuri-Coiromonte (Prov. di Novara, Italy). The Omnidiet Hotel offers for New Year’s Eve an exquisite Menu (vegetarian or non-vegetarian), reservation required. The concert starts at 10:00 pm and will continue till 1:00 am. Free entry. 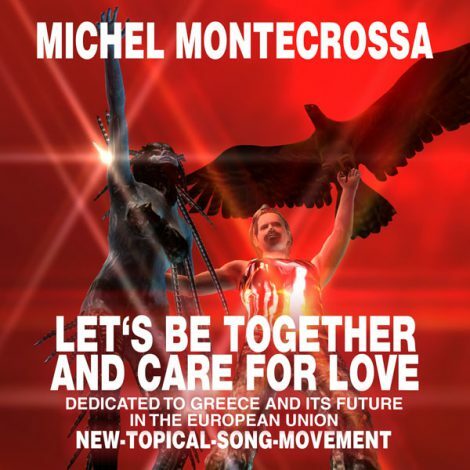 Let‘s Be Together And Care For Love‘ released by Mira Sound Germany on Audio Single and DVD, is Michel Montecrossa’s New-Topical-Song dedicated to Greece whose people are one of the first in Europe who became victims of ruthless banka-gangstas and polito-corruptos that want to exploit the European workers and tax-payers. ‘Talking Selfish David From England (Is It David Cameron? 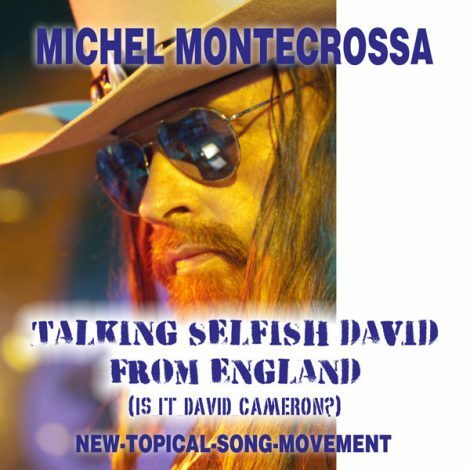 )‘, released by Mira Sound Germany on Audio Single and DVD, is Michel Montecrossa’s New-Topical-Song dedicated to PM David Cameron who has vetoed an EU-wide treaty change to tackle the eurozone crisis, making the mistake to separate and isolate England. Come gather ‘round me people and listen to this song / ‘cause selfish David from England is missing the chance / of working for the people and not the banka-gang. / He is betrayin’ solidarity and European Unity, / helps to make the poor ever more poor. Unity is needed and not division, / lookin’ beyond one’s nose and not treachery. / Selfish David from England is missing the chance / of ending secret banking that brings our nations down. Selfish David from England is missing the chance / to stand for international cooperation. / Instead he’s performing ruthless calculation, / takes the easy money for the price of all. by courageously applying fair bank regulation / and by joining the union again. 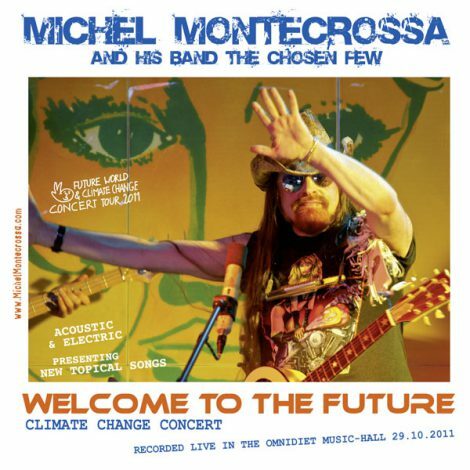 Welcome To The Future’ Climate Change & New-Topical-Song Concert, released by Mira Sound Germany as Double Audio-CD and DVD is Michel Montecrossa’s twenty-fourth concert of the Future World & Climate Change Concert Tour 2011. Performed on 29th October 2011 at Mirapuri in the Omnidiet Music Hall. It presents 26 acoustic and electric hot-spot songs including New-Topical-Songs like ‘Talking Italy, Portugal, Spain Austerity‘, ‘Die Zukunft ist eine andere Welt‘, ‘Talking ‘Bout A Small Planet For The Free‘ and ‘Are You Ready For The Future?‘. The electric part features dancedrive songs like ‘Welcome To The Future‘, ‘For All The Good Things‘, ‘Honeydrive‘, ‘Cruisin’‘ and ‘Ladyluck Tribal‘. 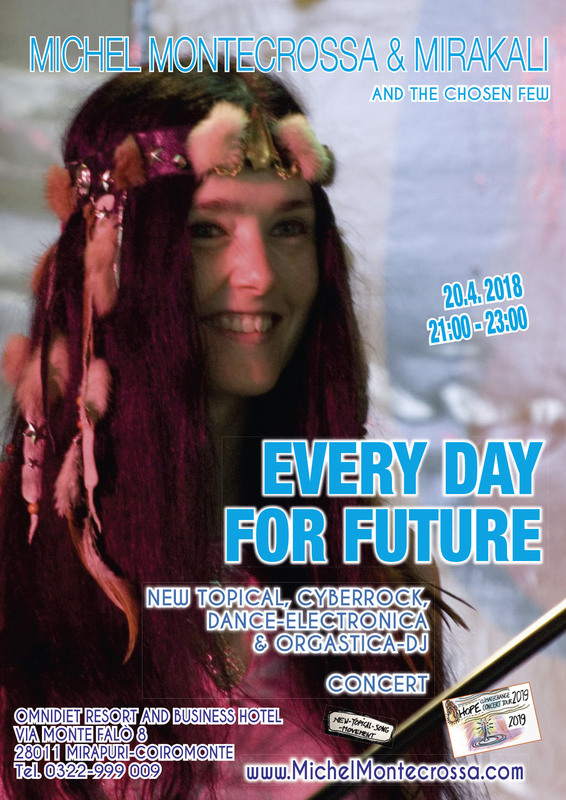 Mirakali and Diana Antara contribute great songs like ‘Tranceparadise‘ and ‘Futureflight‘. 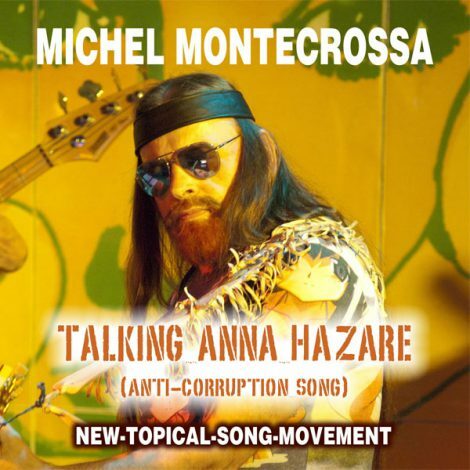 ‘Talking Anna Hazare‘, released by Mira Sound Germany on Audio Single and DVD, is Michel Montecrossa’s New-Topical-Song dedicated to the Anti-Corruption movement in India and the world. to always stay at the lowest level. into lonely depression and shame. 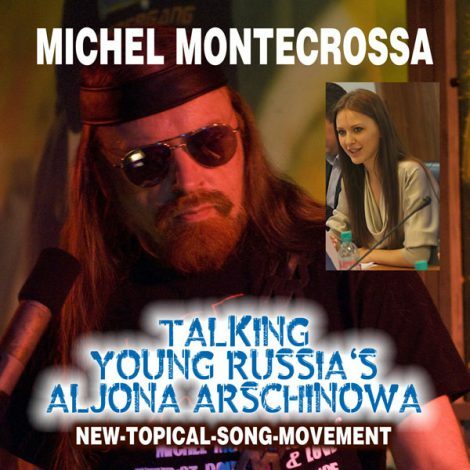 ‘Talking Young Russia’s Aljona Arschinowa / Алена Аршинова’ released by Mira Sound Germany on Audio Single and DVD, is Michel Montecrossa’s New-Topical-Song about young Russia’s future in times of uprising, new outlooks and urgent drive for self-determination. “‘Talking Young Russia’s Aljona Arschinowa’ is a song dedicated to young Russia eager for multiple new ways towards building its own future. Aljona follows one of the ways. She is captain of the ‘Young Guard’ and wants to stand for fresh blood, WLAN epidemic, modernization, free press and human rights. The youth movement of Russia today is a strong diversity of directions heavily sweeping between idealism, uprising, protest, new thinking and fearful conformity to old power structures. Talking young Russia‘s Aljona Arschinowa. / The party is changin‘ and the mood is good. / What are they doin‘ or want to prove? / I‘m a-talkin‘ young Russia‘s Aljona Arschinowa. She has laughin‘ and stars in her face. / She likes Putin Superman and likes to feel great. / In Kolkovo you‘ll find Russia‘s Silicon Valley. / It‘s not like living in a poisoned town. Aljona is dream-magic for the young Russians / while commodities make Russian export strong. / Singin‘ and dancin‘ won‘t hurt none. / With Aljona the party will go on. Music she loves and yoga, studied sociology, / wrote articles and columns / and likes to dance herself free. / Best things, I tell you, go beyond all plans. / Wireless for all is not the only thing. I‘m talkin‘ young Russia‘s Aljona Arschinowa. / Youth uprising is there, is adrenalin pure. / The party is changing into another mood. / Youth uprising, I tell you, / shows what you have to do.